Top Lid Loose Type in two pieces 16 swg S.S. 316. or top dished as per clients requirement. Insulation 50 mm thk glaswool cladded with with S.S 304 with 16 Swg Welded. Conections 25 NB, bottom valve, Jacket : Steam Inlet , condensate outlet, Jacket Drain with plug, Water Inlet is provided. Legs 40 NB, Heavy Guage S.S. pipe S.S.304. 4 nos. Sensor PT-100 for Digital Indicator. Jacket Pressure 3.5 Kgs.cm.sq working. Finish Internal and all contact parts buffed to 240 grit mirror finish and external bufed to 150 grit matt finish. Shell 6 mm S.S. 316. Top Dish Type 6 mm Thick S.S. 316. Jacket 6 mm thk SS. 304 with spiral patten Stiffeners . cladded with 16 swg S.S 304 welded. Gasket silicon fitted in groove. Insulation 50 mm Thick Glass wool with 16 swg S.S. 304 cladding welded. Legs 3 nos S.S. pipe heavy guage. Nozzels Vacuum Manifold with Vacuum Gauge, Vacuum Nozzle and vent Valve, product outlet , bottom full bore ball valve S.S. 316.Jacket steam inlet, condensate outlet, Drain Plug, Cooling water inlet, Cooling Water Outlet, Manifold with safety valve, Pressure gauge etc. Bottom Clearance 500 mm from ground level to valve or as required. Agitator Anchor type S.S. 316 . driven by suitable HP dual rpm motor coupled with gear box. Bearing Housing Angular Roller Bearing 2 Nos Mounted on a Lantern support caldded with S.S. 304 sheet. S.S. 304 guard is provided. Homoginizer Bottom Entry High speed Emulsifier of suitable H.P. /440V/1440 RPM/TEFC Motor. Shaft Seal Mechanical Seal with cooling Arrangement mounted on a conical portion. Sensor PT-100 type will be provided. Mixing vessel to Storage Vessel through lobe pump. 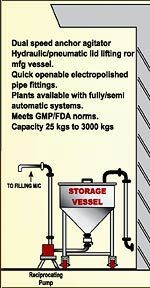 Storage vessel to hopper of filling machine through transfer pump. All pipe are seamless & electropolished from inside and outside. Fittings are DIN standard with silicon gasket. Indicating lamps for main ON & OFF with selector switch. Above pump is used to transfer wax & water to the main mixing tank. 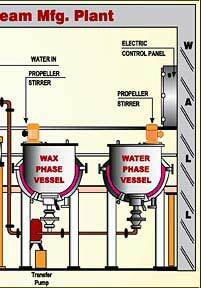 Above pump is used to recirculate final mixed cream for intense mixing & to transfer finished cream from Mixing vessel to storage vessel. Other details are as below. Inlet & outlet : DIN fittings / triclover at inlet & outlet. 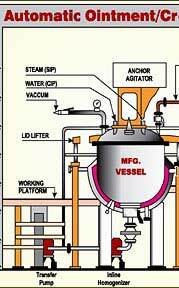 Above pump is used to transfer CREAM/OINTMENT from storage vessel to hopper of filling machine. Above pump is suitable HP & capacity depending on the capacity of the ointment plant vessel . watering / oilring type with silencer & non return valve. The vessel shall be in SS 316Q having cylindrical conical bottom. The vessel will be provided with 40mm ball valve. Shell portion will be flanged from top & bolted to top dish with gasket in bet-ween. All joints are fusion free argon arc welded & inside mirror finished. The vessel will be supported by 4 nos. cladded C class 3 pipe and to maintain 450mm ground clearance. Vessel has 50mm inlet nozzle for finished product entry & vent. This platform will cover both tanks & with AL dimpled plate and SS counter sunk screw. SS 304 Q railing on either side. There is provision of steps on either side.